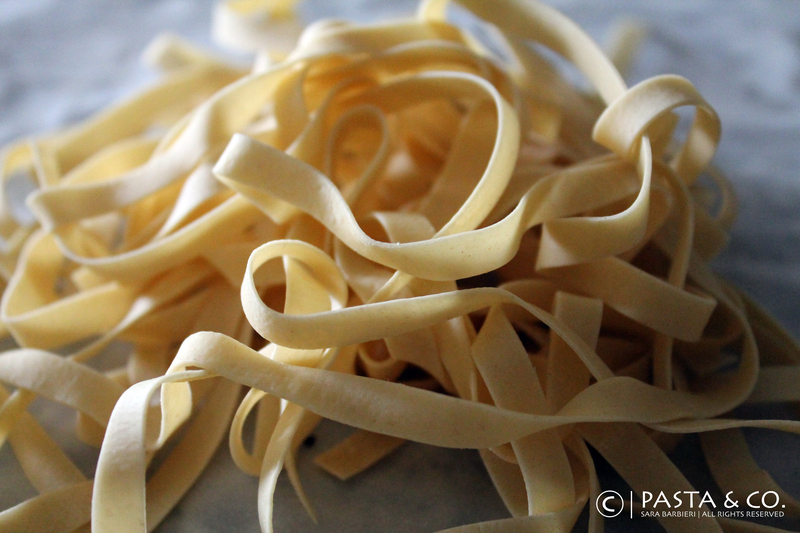 COOKING BASES: How to make fresh pasta from scratch :) | Pasta & Co.
Ready? Let’s roll out some pasta! 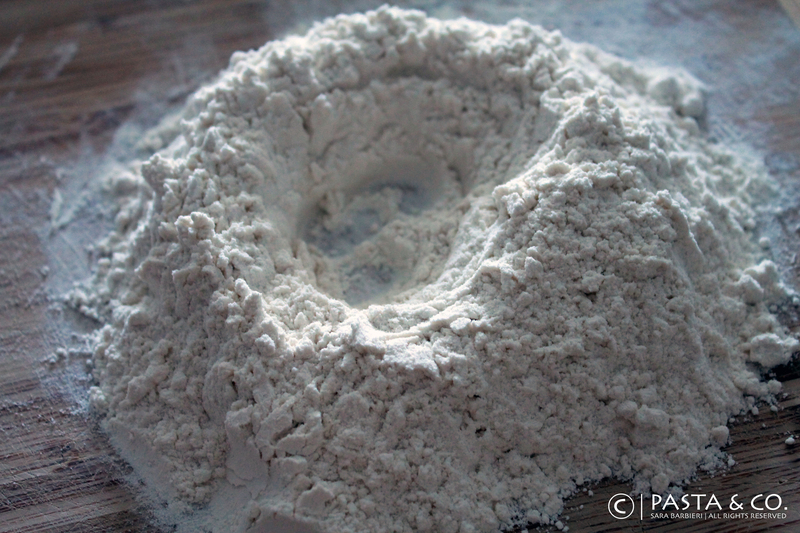 1) Place the flour in the center of a large wooden board. Make a well in the middle and add the eggs. 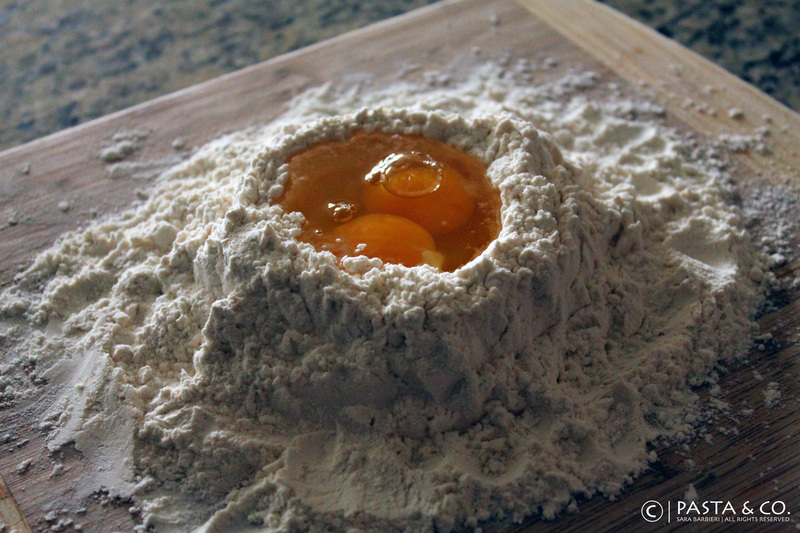 Beat together the eggs with a fork and begin to incorporate the flour starting with the inner rim of the well. Keep pushing the flour up to retain the well shape. Add a pinch of salt. 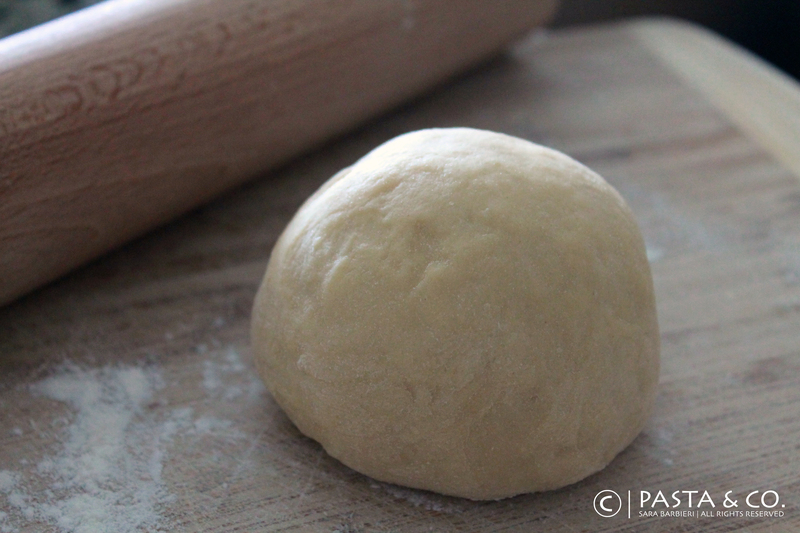 2) Start kneading the dough with your hands. 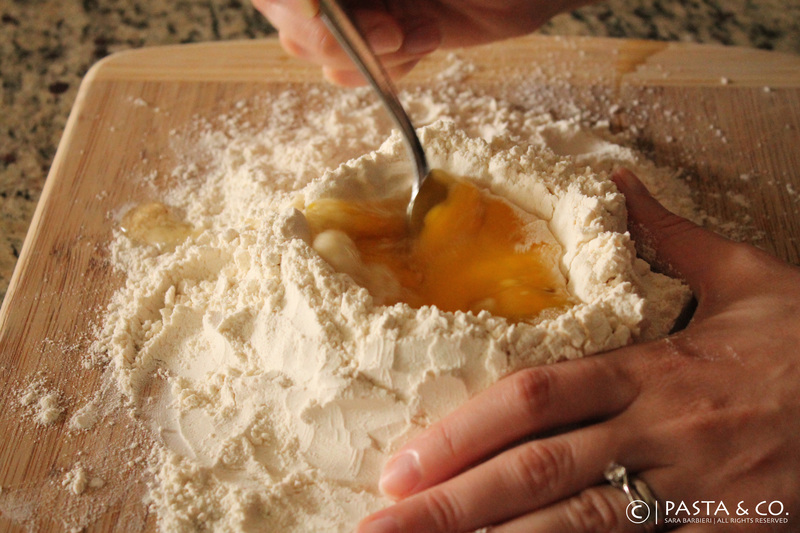 Once the dough is a cohesive mass, remove it from the board, dust with flour and start kneading again. Repeat when necessary. More kneading means better texture. Kneading the dough makes it more elastic and harder to rip. The dough should be an elastic mass when you’re done. You can use a knife and without pressing down you can cut through it. The more bubbles you see the better the dough. Cover the dough with plastic wrap and set aside for 30 minutes at room temperature. 3) Time for rolling out! Prepare two sheets of parchment paper where you will place your pasta sheets once ready. Cut a piece of the dough and flatten it with a rolling pin or with the palm of your hand until it’s about 1/2 of an inch thick and no wider than the slot of the machine. With the slot of the pasta machine on its widest setting, turn the handle while feeding the dough into the slot. 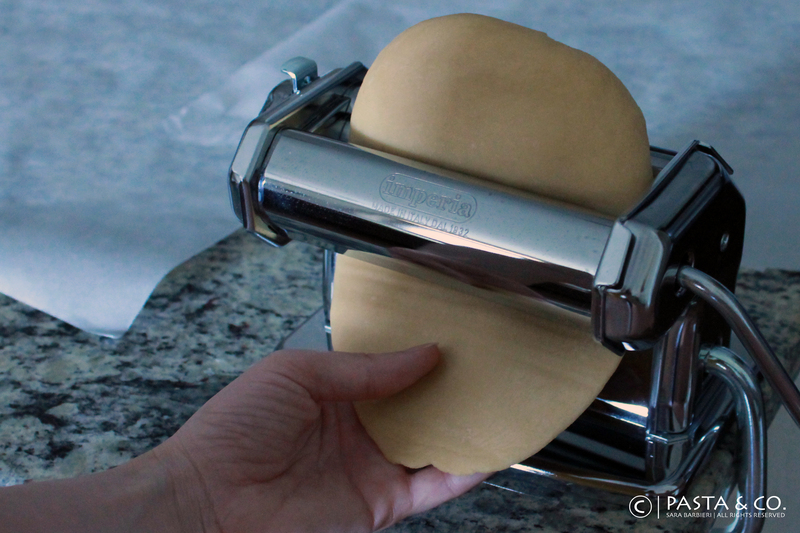 Gently hold the flattened dough as it comes out of the pasta machine, but don’t pull on it. 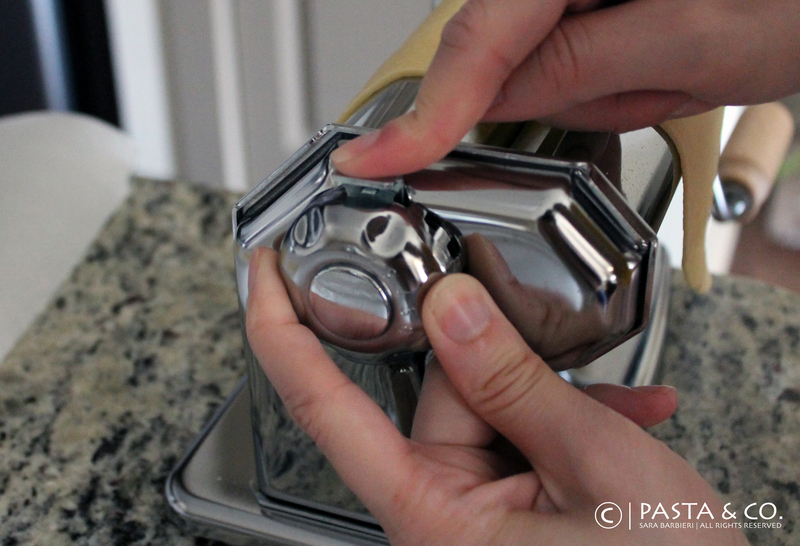 Instead, gently hold the dough as it exits the pasta machine so it doesn’t tear. 4) After the dough has completely passed through the pasta machine, turn the slot down to the next smallest setting and pass the dough through the slot. 5) Continue to do this, making the slot smaller by one each time. As you continue rolling the pasta, your sheet of dough will get longer and longer. Cut it in half and continue passing the dough through the machine until it’s about an 1/16th of an inch thick. You’re done! Almost :) Now you can use your machine to make tagliatelle, tagliolini, fettuccine, pappardelle or lasagne or use cookie cutters or stamps to make stuffed pasta, like mezzalune, ravioli or tortelli. Enjoy! Proportions are 100 gr flour and one egg per person. No water, no milk. Only flour, eggs and muscles. Or the best pasta machine, Imperia. I brought it with me to the US (that was SO heavy) but I’ve seen it once at Marshalls (!!!) for $40. Williams-Sonoma sells it for $80. A wooden board for kneading is an essential tool, as wood will absorb humidity. If you’re using a rolling pin, this also has to be a wooden one. To keep the dough from drying out, make sure that your pasta ball and sheets are sealed with plastic wrap.